Composed in 1882/3, Rimsky-Korsakov’s Piano Concerto was the last of a series of works written in the very happy middle period of his life; other compositions of this period, rich in charming lyricism, included the opera The Snow Maiden and the orchestral Szakza (‘Fairy Tale’). The Concerto was first performed in March 1884 at one of Balakirev’s Free School concerts in St Petersburg and was the last work of Rimsky to be wholly approved of by his erstwhile mentor. While the lyricism is still sincere and deeply felt in the Concerto, the work also foreshadows the master artificer of the later years. Dedicated to the memory of Liszt, it is indebted to that composer in its single-movement structure (akin to Liszt’s Second Concerto in A major) and in its virtuosic decorative pianism. 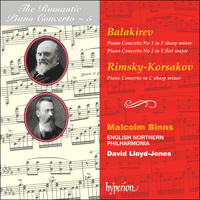 Unlike the Liszt Concerto, however, Rimsky-Korsakov’s is based on only one theme—No 18 from Balakirev’s seminal folksong collection which had been published in 1866. After four prefatory bars, the folksong is heard on the solo bassoon and again, not long afterwards, on the clarinet. This slow introduction is followed by an Allegretto in the rhythm of a polonaise (‘quasi polacca’), an Andante mosso middle section and a final Allegro, so the basic three-movement form of the conventional concerto is adhered to, but telescoped into a single movement. The metamorphoses of the folksong are always felicitous, and are very clear to the listener. The widely-spaced left-hand accompanimental figure in the lovely central Andante is itself based on the opening of the folksong, while the melodic material is derived from the second part of the song. After this has reached an impassioned climax, the final Allegro is ushered in by vigorous piano chords followed by upward octave semiquaver whole tone scales, and the delight of Balakirev in the genuine warm-hearted lyricism, the well-written bravura passages and the thoroughly appropriate use of the folksong, allows us to place the work still firmly within the Russian nationalist orbit. Furthermore, it influenced concerted pieces by many later Russian composers, including Glazunov, Arensky and, most particularly, Rachmaninov, whose Piano Concerto No 1 was to be written less than a decade later. It was towards the end of 1855, while he was still in his teens, that the brilliant young pianist and composer Balakirev was brought to St Petersburg from Nizhny-Novgorod by his patron A D Ulybyshev, and his first, very successful, public appearance was as soloist in this concerto movement in February, 1856. It is the work of a young lion who has thoroughly absorbed his sources, especially Chopin in this case (Chopin’s E minor Concerto was to remain a favourite of Balakirev’s all his life). Both the main subjects of the movement are heard in the lengthy opening orchestral tutti, and occur in piano solo versions after the entry of that instrument, as well as in many other forms in the course of the movement. The music must have been especially prepared for the performance, but afterwards Balakirev turned his attention to his Overture on a Spanish march theme given to him by Glinka, to whom he had recently been introduced, and to a very important Overture based on Russian folksongs, and so this delightful first movement was destined to remain on its own, for, by the time he took up he took up his pen for more concerto writing, the experience he had gained in the works already mentioned as well as in the superb overture and incidental music to Shakespeare’s King Lear meant that it was to a new concerto that he turned. This Concerto was started in 1861 and is in E fiat major, the key of Liszt’s first Piano Concerto; Balakirev was also looking at Anton Rubinstein’s second Concerto and Litolff’s fourth at the time. By the end of 1862 he had completed the first movement and extemporised the rest of the Concerto to his circle, including not only Mussorgsky but Rimsky-Korsakov, who was particularly delighted with the result. But Balakirev abandoned the Concerto and could not be prevailed upon to return to it until 1906, and even then he died in 1910 having added in its entirety only the second movement; Sergei Liapunov completed the finale in accordance with the composer’s wishes which, as his closest associate in the later years, he knew well enough. The first subject occurs at the beginning of a short orchestral tutti and is clearly destined for a heroic role. It has a certain affinity with the opening of Beethoven’s ‘Eroica’ Symphony (in E flat) and also with Schumann’s E flat Symphony (No 3, ‘The Rhenish’), of which Balakirev was very fond. The principal second subject is introduced by the piano in the far-flung key of G flat major—and is recapitulated not, as one would expect, in E flat but in D major. This type of semitonal relationship was an important facet of Balakirev’s style, and the key scheme demonstrates his refusal to allow himself to be moulded in a conventional fashion. This is also shown in the remote key of the strikingly beautiful slow movement, B minor. The main theme is the Russian Orthodox Requiem chant ‘So sviatymi upokoi’, played at first by the orchestra after six bars of modulatory introduction, and impeccably treated throughout. The second subject, in D major, sheds a ray of hope in distinguished opposition to, or rather co-existence with, its neighbour. After considerable development of the Requiem theme, it is recapitulated on the full orchestra, with sonorous brass and brilliant piano chords; a low E on the bass tuba is particularly magnificent. Gradually, in a coda, the Requiem theme dies and the first theme of the first movement is used to act as a bridge to the finale, Allegro risoluto. The principal key of this ebullient finale is again unorthodox: G flat major. The first subject is full of rhythic vigour; the second consists of alternating chords of the type used by Mussorgsky at the opening of the coronation scene in Boris Godunov—but here in the Concerto the effect is effervescent rather then severe, a perfect antidote to the gravity of the slow movement. Towards the end, the opening subject of the Concerto reappears, and it finishes as it had begun, in E flat major. Balakirev’s Concerto does not deserve the neglect into which it has fallen. In spite of the half century or so it took to compose, it holds together well. And the heroic nature of the first movement, the solemn and intense beauty of the second and the scintillation of the third, ensure that the listener is treated to a wide variety of aural experience which adds up, in the end, to a satisfactory whole. Composé en 1882/3, le Concerto pour piano de Rimski-Korsakov a été la dernière œuvre d’une série écrite au cours de la période très heureuse du milieu de sa vie; parmi les autres compositions de cette période, riches en lyrisme charmant, figurent l’opéra Snegourotchka et la pièce orchestrale Skazka («Conte féerique»). Le Concerto fut exécuté pour la première fois en mars 1884 à Saint-Pétersbourg lors d’un concert de l’Ecole libre de Balakirev, et fut la dernière œuvre de Rimski-Korsakov qu’ait entièrement approuvée son ancien mentor. Si le lyrisme y est toujours sincère et profond, le Concerto annonce aussi le maître artificier des années suivantes. Dédié à la mémoire de Liszt, il doit à ce compositeur sa structure en un seul mouvement (semblable à celle du deuxième Concerto en la majeur de Liszt) et son pianisme orné et virtuose. Contrairement au Concerto de Liszt cependant, celui de Rimski-Korsakov est basé sur un seul thème, le no18 de l’important recueil d’airs populaires que Balakirev avait publié en 1866. Après quatre mesures d’introduction, le basson joue l’air populaire, repris peu après par la clarinette. Cette introduction lente est suivie d’un Allegretto au rythme de polonaise («quasi polacca»), d’une partie intermédiaire Andante mosso et d’un Allegro final. L’œuvre se conforme ainsi à la forme traditionnelle en trois mouvements du concerto classique, mais en les télescopant en un seul. Les métamorphoses de l’air populaire sont toujours heureuses, et très claires pour l’auditeur. Le motif d’accompagnement à la main gauche, aux notes largement espacées, du ravissant Andante central est lui-même inspiré par le début de l’air, tandis que le matériau mélodique est tiré de sa deuxième partie. Après que la musique ait atteint le plus haut degré de la passion, l’Allégro final est introduit par de vigoureux accords au piano suivis de gammes ascendantes par tons entiers de doubles croches à l’octave. L’admiration de Balakirev pour le lyrisme profond et chaleureux, les morceaux de bravoure soignés et l’utilisation parfaitement appropriée de l’air populaire, nous permet de placer cette œuvre entièrement dans la sphère d'influence de l’école nationaliste russe. Elle exerça en outre une influence sur les œuvres concertantes de nombreux compositeurs russes ultérieurs, entre autres Glazounov, Arenski et plus particulièrement Rachmaninov dont le premier Concerto pour piano allait être écrit moins d’une décennie plus tard. C’est vers la fin de 1855, alors que Balakirev était encore adolescent, que son protecteur Oulibichev emmena le brillant jeune pianiste-compositeur de Nijni-Novgorod à Saint-Pétersbourg. Il fit sa première apparition en public, couronnée de succès, comme soliste dans ce mouvement de Concerto en février 1856. C’est l’œuvre d’un jeune lion qui a complètement assimilé ses sources d’inspiration, spécialement Chopin en l’occurrence (le Concerto en mi mineur de Chopin allait demeurer une œuvre de prédilection de Balakirev toute sa vie). On entend les deux sujets principaux du mouvement dans le long tutti orchestral d’ouverture, puis dans des versions pour piano seul après l’entrée de cet instrument, ainsi que sous beaucoup d’autres formes au cours du mouvement. La musique avait dû être spécialement préparée pour le concert, mais après Balakirev réserva tous ses soins à son Ouverture sur un thème de marche espagnol que lui avait donné Glinka, auquel il avait été récemment présenté, et à une très importante Ouverture inspirée par des airs populaires russes. C’est ainsi que ce ravissant premier mouvement demeura solitaire, car lorsque Balakirev revint à la forme concertante, il préféra utiliser l’expérience qu’il avait acquise avec les œuvres mentionnées ci-dessus, ainsi que la superbe ouverture et musique de scène du King Lear de Shakespeare, pour un concerto entièrement nouveau. Ce Concerto, commencé en 1861, est en mi bémol majeur, la tonalité du premier Concerto pour piano de Liszt; Balakirev examinait aussi à l’époque le deuxième Concerto pour piano d’Anton Rubinstein et le quatrième de Litolff. Fin 1862 il avait terminé le premier mouvement et improvisé le reste du Concerto devant son cercle d’amis, qui comprenait non seulement Moussorgski mais aussi Rimski-Korsakov, qui l’apprécia particulièrement. Mais Balakirev abandonna le Concerto et ne put être amené à s’y remettre qu’en 1906. Lorsqu’il mourut en 1910, il n’avait encore terminé que le deuxième mouvement; Serge Liapounov acheva le finale selon les vœux du compositeur, dont il avait été l’associé le plus intime à la fin de sa vie. Le premier sujet, qui apparaît au début d’un bref tutti orchestral, est clairement destiné à un rôle héroïque. Il a une certaine affinité avec le début de la symphonie «Héroïque» de Beethoven (en mi bémol) et aussi avec la Symphonie en mi bémol de Schumann (no3, «Rhénane»), pour laquelle Balakirev avait une prédilection. Le deuxième sujet principal est introduit par le piano dans le ton très éloigné de sol bémol majeur—et réexposé non pas en mi bémol comme on s’y attendrait, mais en ré majeur. Ce genre de rapport demi-tonal était un important aspect du style de Balakirev, et les variations de tonalité démontrent son refus de se laisser mouler dans un mode conventionnel. Ce refus est aussi manifeste dans le ton éloigné du très beau mouvement lent, si mineur. Son thème principal est le chant de requiem russe orthodoxe «So sviatimi oupokoi», joué d’abord par l’orchestre après six mesures d’introduction modulatoire, et impeccablement traité tout du long. Le second sujet, en ré majeur, jette une lueur d’espoir en opposition distincte, ou plutôt coexistence avec son voisin. Après un ample développement du thème du Requiem, il est réexposé par l’orchestre au complet, avec cuivres retentissants et brillants accords au piano; un mi grave au bass-tuba est particulièrement superbe. Peu à peu, dans une coda, le thème du Requiem s’éteint et c’est le premier thème du premier mouvement qui sert de lien avec le finale, Allegro risoluto. La tonalité principale de ce finale exubérant est encore peu orthodoxe: sol bémol majeur. Le premier sujet est plein de vigueur rythmique; le deuxième consiste en accords alternés du genre de ceux qu’emploie Moussorgski au début de la scène du couronnement de Boris Godounov, mais ici l’effet est effervescent plutôt que sévère, le parfait antidote à la gravité du mouvement lent. Vers la fin, le premier sujet du Concerto reparaît, et il s’achève comme il avait commencé, en mi bémol majeur. Le Concerto de Balakirev ne mérite pas l’oubli dans lequel il est tombé. Malgré le demi-siècle que prit à peu près sa composition, il a une parfaite cohésion. Et le caractère héroïque du premier mouvement, la beauté solennelle et intense du deuxième, et le scintillement du troisième, offrent à l’auditeur une grande diversité d’expériences auditives qui constituent pour finir un tout satisfaisant. Das 1882/83 komponierte Klavierkonzert von Rimski-Korsakow war das letzte einer Serie von Werken, die in seiner überaus glücklichen mittleren Lebensphase entstanden. Zu den übrigen charmant lyrischen Kompositionen dieser Phase zählen die Oper Schneeflöckchen und die Märchensuite („Skazka“). Das Konzert wurde im März 1884 an Balakirews Freischule in St Petersburg uraufgeführt und war das letzte Werk von Rimski-Korsakow, mit dem sein einstiger Mentor durchweg einverstanden war. Zwar ist der lyrische Charakter des Konzerts nach wie vor ehrlich und tief empfunden, doch läßt das Werk bereits den späteren Meister der Stilisierung erahnen. Es ist dem Andenken Liszts gewidmet und diesem Komponisten durch seine einsätzige Struktur (ähnlich Liszts 2. Konzert in A-Dur) und seine virtuos dekorative Klavierdarbietung verpflichtet. Im Gegensatz zu Liszts Konzert ist das von Rimski-Korsakow jedoch auf einem einzigen Thema aufgebaut—der Nr. 18 aus Balakirews bedeutender Volksmusiksammlung, die 1866 veröffentlicht worden war. Im Anschluß an vier einleitende Takte ist die Volksweise zu hören, erst auf dem Solofagott und bald danach auf der Klarinette. Dieser langsamen Einleitung folgen ein Allegretto im Polonaiserhythmus („quasi polacca“), ein Andante mosso bezeichneter Mittelteil und zum Schluß ein Allegro. Somit wird die dreisätzige Grundform des herkömmlichen Konzerts eingehalten, nur zusammengefaßt in einem einzigen Satz. Die Metamorphosen der Volksweise sind immer treffend und für den Hörer klar erkennbar. Die ausgreifende Begleitfigur der linken Hand im reizvollen zentralen Andante beruht ebenfalls auf dem Anfang der Volksweise, während das melodische Material dem zweiten Teil des Liedes entstammt. Nachdem ein leidenschaftlicher Höhepunkt erreicht ist, wird das abschließende Allegro von kraftvollen Klavierakkorden vorbereitet, gefolgt von aufwärtsstrebenden oktavischen Sechzehnteln in Form von Ganztonleitern. Die von Balakirew geäußerte Freude über die echte lyrische Warmherzigkeit, die Wohlgestalten Bravurapassagen und den durchweg angemessenen Umgang mit der Volksweise erlauben es uns, dieses Werk nach wie vor eindeutig im russisch-nationalistischen Umkreis einzudordnen. Zudem hat es konzertante Werke zahlreicher späterer russischer Komponisten beeinflußt, darunter auch Glasunow, Arenski und insbesondere Rachmaninow, dessen 1. Klavierkonzert weniger als ein Jahrzehnt danach entstand. Gegen Ende 1855, er war damals noch minderjährig, wurde der brillante junge Pianist und Komponist Balakirew von seinem Gönner A D Ulibischew von Nischni Nowgorod nach St Petersburg geholt, und sein erster, höchst erfolgreicher öffentlicher Auftritt im Februar 1856 erfolgte als Solist im vorliegenden Konzertsatz. Es handelt sich um das Werk eines gefeierten Jungkünstlers, der seine Vorbilder gründlich verarbeitet hat, in diesem Fall vor allem Chopin (Chopins Konzert in e-Moll sollte sein Leben lang eines von Balakirews Lieblingsstücken bleiben). Beide Hauptthemen des Satzes erklingen im langen Orchestertutti zu Beginn und treten in verschiedenen Soloklavierversionen nach dem Einsetzen des Instruments wieder auf, sowie in vielen anderen Formen im weiteren Verlauf des Satzes. Die Musik muß eigens für die eine Aufführung geschaffen worden sein, doch anschließend wandte Balakirew seine Aufmerksamkeit der Ouvertüre über ein spanisches Marschthema zu (das Thema hatte ihm Glinka überlassen, den er kurz zuvor kennengelernt hatte), und einer bedeutenden Ouvertüre nach russischen Volksliedern. Dadurch blieb dieser herrliche erste Satz für sich allein stehen, denn als Balakirew das nächste Mal zur Feder griff, um weitere Konzerte zu schreiben, bedeutete die Erfahrung, die er mit den erwähnten Werken und mit der erlesenen Ouvertüre und Schauspielmusik zu Shakespeares König Lear erworben hatte, daß er sich an einem neuen Konzert versuchte. Das 1861 begonnene Konzert steht in Es-Dur, der Tonart von Liszts erstem Klavierkonzert; außerdem orientierte sich Balakirew damals am zweiten Klavierkonzert von Rubinstein und am vierten von Litolff. Ende 1862 hatte er den ersten Satz fertiggestellt und seinem Zirkel das übrige Konzert im Entwurf vorgeführt. Dem Zirkel gehörte nicht nur Mussorgski, sondern auch Rimski-Korsakow an, der von dem Ergebnis besonders erbaut war. Balakirew aber ließ das Konzert liegen und war erst 1906 zu bewegen, wieder darauf zurückzukommen, und selbst dann fügte er bis zu seinem Tod 1910 insgesamt nur den zweiten Satz hinzu. Sergei Ljapunow vollendete das Finale entsprechend den Wünschen des Komponisten, über die er als sein engster Mitarbeiter der letzten Jahre genauestens Bescheid wußte. Das erste Thema tritt zu Beginn eines kurzen Orchestertutti in Erscheinung und ist eindeutig dazu bestimmt, eine heroische Rolle zu spielen. Es hat eine gewisse Ähnlichkeit mit der Eröffnung von Beethovens Sinfonie „Eroica“ (in Es-Dur) sowie mit Schumanns Es-Dur-Sinfonie (Nr. 3, die „Rheinische Sinfonie“), die Balakirew sehr schätzte. Das erste Seitenthema wird vom Klavier in der entlegenen Tonart Ges-Dur eingeführt—seine Reprise erfolgt nicht, wie eigentlich zu erwarten, in Es-Dur, sondern in D-Dur. Derlei semitonale Bezüge bildeten eine wichtige Facette von Balakirews Stil. Außerdem demonstriert dieses Tonartschema seine Weigerung, sich der Konvention anzupassen. Das erweist sich auch an der entlegenen Tonart h-Moll des bemerkenswert schönen langsamen Satzes. Dessen Hauptthema ist die russisch-orthodoxe Requiemmelodie „So swjatymi upokoi“, die im Anschluß an sechs Takte modulatorischer Einleitung zunächst vom Orchester gespielt und durchweg makellos verarbeitet wird. Das zweite Thema in D-Dur sendet einen Hoffnungsstrahl aus, deutlich im Gegensatz zu oder vielmehr in Koexistenz mit seinem Nachbarmotiv. Nachdem das Requiemthema gründlich durchgeführt worden ist, folgt seine Reprise durch das ganze Orchester mit tönenden Blechbläsern und brillanten Klavierklängen; ein tiefes E der Baßtuba wirkt besonders erhaben. Im Rahmen einer Coda verklingt allmählich das Requiemthema, und das erste Thema des ersten Satzes dient als Brücke zum Finale mit der Bezeichnung Allegro risoluto. Die Haupttonart dieses überschwenglichen Finales ist wiederum unorthodox; Ges-Dur. Das erste Thema steckt voller rhythmischer Triebkraft; das zweite besteht aus alternierenden Akkorden jenes Typs, den Mussorgski für die Einleitung der Krönungsszene in Boris Godunow verwendet hatte—hier im Konzert jedoch ist der Effekt nicht tiefernst, sondern überschäumend, perfektes Gegenmittel zur Ernsthaftigkeit des langsamen Satzes. Gegen Ende taucht das erste Thema des Konzerts noch einmal auf, und es endet, wie es begonnen hatte, in Es-Dur. Balakirews Konzert hat die Vernachlässigung, der es anheimgefallen ist, nicht verdient. Obwohl seine Komposition ein halbes Jahrhundert in Anspruch genommen hat, passen die einzelnen Teile gut zueinander. Und der heroische Charakter des ersten Satzes, der feierlich und eindringlich schöne zweite und der funkensprühende dritte Satz sorgen dafür, daß dem Publikum ein mannigfaltiges Hörerlebnis geboten wir, das sich zum Schluß zu einem befriedigenden Ganzen zusammenfügt.